Combine the garlic, bacon and thyme and rub this paste on the outside of the leg and then season the inside with salt and pepper. Tie the leg together with string. Place the lamb in a roasting pan with some olive oilo and wine and roast in a preheated oven at 200°C, Gas Mark 5, for 30 minutes. Add the potato with the second garlic and the rosemary and season with salt. Pour the cooking juices from the lamb over the potatoes and cook for another 45 minutes. When cooked (the meat should be pink), remove from the oven and let the meat rest for five minutes. 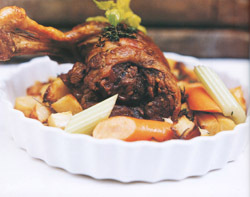 Divide the lamb into four portions and serve with potatoes and a generous dose of juices.